For a long time I was suffering from a bunion which deformed my foot and I was referred by my doctor to SGH, Podiatry department for treatment. However, my frequent visits to the Podiatry department did not result in any improvement. One day I decided to ask the podiatrist if I should go for surgery. However, the podiatrist and his 2 colleagues discouraged me from doing so, saying that not every such surgery turns out successful. Some patients still suffer pain after surgery. The podiatry department eventually discharged me together with lots of padded rings etc for the discomfort in my toes. Over the years, the bunion became more disturbing and it caused quite unbearable pain when I walk. As surgery was not an option, I would always turn to our Lord Jesus and say: “Jesus, you can remove this pain from me” with true conviction. One morning, I woke up to find the sole of one foot in pain and I had to limp about. As the pain did not go away, I sought treatment from an orthopaedic doctor under SGH at Camden Medical Center. Surprisingly, the orthopaedic doctor did not regard the pain in my sole as requiring treatment. 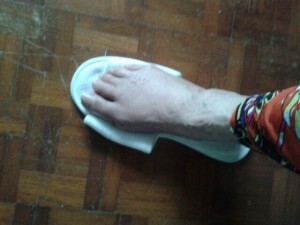 However, his focus was on my twisted toes and he told me that I should go for surgery. I told him about the negative comments from my previous podiatrist but he told me he would refer me to his colleague, an orthopaedic surgeon, who is very good in toe operations. He further advised me to go back to him for treatment for the pain in my sole after the toes operation. As the orthopaedic surgeon was going away for a course, I opted to have the operation within a week. The day after the surgery, the surgeon came to see me and he said: “you are the best patient because you were not nervous at all.” I replied: “Doctor, I commit the operation to Jesus.”, hoping he would not feel insulted that I did not trust his ability. Praise God, he was thrilled and told me he worships at Church of Singapore. I told him I worship at Bethel Assembly of God. After my discharge when I went back to the surgeon for check-up, he examined the shape of my foot and simply exclaimed “EXCELLENT!” My foot had been totally restored and was no longer deformed or painful. Miraculously, the pain in my sole also disappeared after the surgery on my toes! I did not have to go back to the orthopaedic doctor for any treatment! I want to Thank and Praise God that He led me to a doctor who referred me to a surgeon to restore my foot and take away the unbearable pain that I had been suffering for years and which I had been praying with true conviction that Jesus can remove! The name Jesus in Hebrews means :- Salvation which leads to Healing, Wellness, Preservation, Provision, Prosperity, Safety and Deliverance. Thank you dear Jesus, you were born to save us!